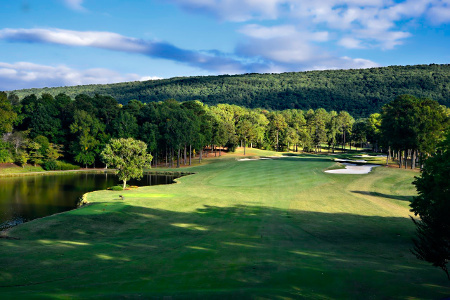 Far Hills, N.J. (May 27, 2014) — Shoal Creek, located near Birmingham, Ala., has been selected by the United States Golf Association to host the 2018 U.S. Women’s Open Championship, May 31-June 3. The 2018 U.S. Women’s Open will be the third USGA championship conducted at Shoal Creek. In 1986, Stewart “Buddy” Alexander won the U.S. Amateur Championship, defeating Chris Kite, 5 and 3, in the final. In 2008, Cameron Peck captured the U.S. Junior Amateur, and his 10-and-8 victory over Evan Beck stands as the largest winning margin in Junior Amateur championship-match history. The U.S. Women’s Open has been held prior to the U.S. Open only three times in its 69-year history, all within a five-year period. Pine Needles Lodge & Golf Club, in Southern Pines, N.C., hosted the 1996 championship from May 30–June 2, and the 2001 championship from May 31–June 3. Old Waverly Golf Club, in West Point, Miss., hosted the 1999 championship from June 3–6. Shoal Creek was designed by Jack Nicklaus and opened for play on Nov. 1, 1977, with three U.S. Open champions—Hubert Green (1977), Nicklaus (1962, 1967, 1972, 1980) and Jerry Pate (1976)—playing in the inaugural round. Beyond its USGA history, Shoal Creek boasts a long legacy of championship play. The club hosted the 1984 and 1990 PGA Championships, won by Lee Trevino and Wayne Grady, respectively. Since 2011, Shoal Creek has served as the venue for the Regions Tradition, a major on the Champions Tour. Kenny Perry won the 2014 championship on May 18, while Tom Lehman (2011–12) and David Frost (2013) have also won the event. Shoal Creek has also hosted numerous collegiate events, including the 1978 Southeastern Conference Championship and the Jerry Pate Intercollegiate Invitational, as well as several state and regional amateur events, including the 2010 Southern Amateur Championship. The 2014 U.S. Women’s Open will be contested on the famed Course No. 2 at Pinehurst Resort & Country Club in the Village of Pinehurst, N.C., as part of the historic back-to-back championships, one week after the U.S. Open is played on the same course. The 2015 U.S. Women’s Open will be conducted at Lancaster (Pa.) Country Club on July 9–12, the 2016 championship will be conducted July 7–10 at CordeValle in San Martin, Calif., and the 2017 U.S. Women’s Open will be conducted July 13–16 at Trump National Golf Club in Bedminster, N.J. The USGA conducts the U.S. Open, U.S. Women’s Open and U.S. Senior Open, as well as 10 national amateur championships, two state team championships and international matches attracting players and fans from more than 160 countries. Together with The R&A, the USGA governs the game worldwide, jointly administering the Rules of Golf, Rules of Amateur Status, Equipment Standards and World Amateur Golf Rankings. The USGA’s reach is global, with a working jurisdiction comprises the United States, its territories and Mexico, serving more than 25 million golfers and actively engaging 150 golf associations.